Had a great day today visiting Yorkshire Wildlife Park with the Association of Animal Artists. Painting from life is something that I am becoming increasingly interested in and dedicated to (had a wonderful time at a 2 day workshop with Malcolm Coward just last weekend, and of course there is my Beswick project!) 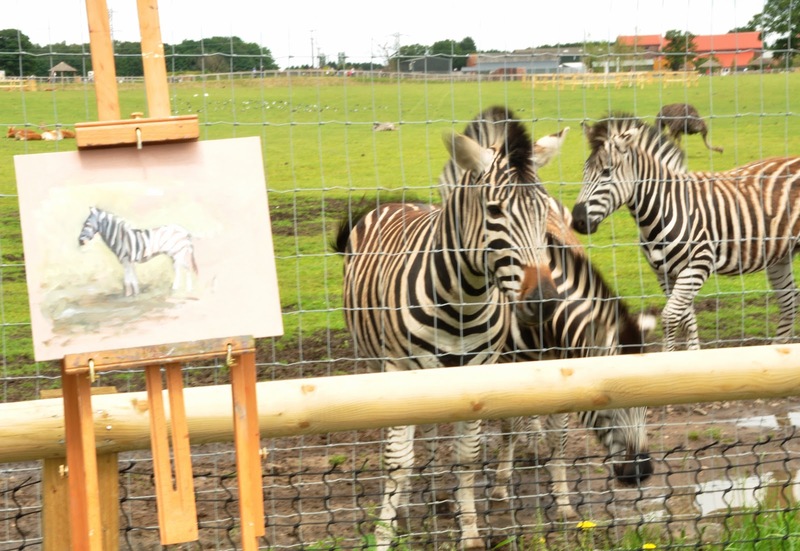 so I decided that I would definitely have a bash at painting some kind of animal at Yorkshire Wildlife Park. I am not very good at it (yet!) but I get a real buzz out of it, and my studio work really benefits from the skills I develop via my life work, regardless of how bad the life paintings are! Arrived this morning, met up with fellow artists, and then left our children with my husband Brian while I carted my easel about looking for a subject. Now, what I really fancied painting was a zebra (no surprises there!) 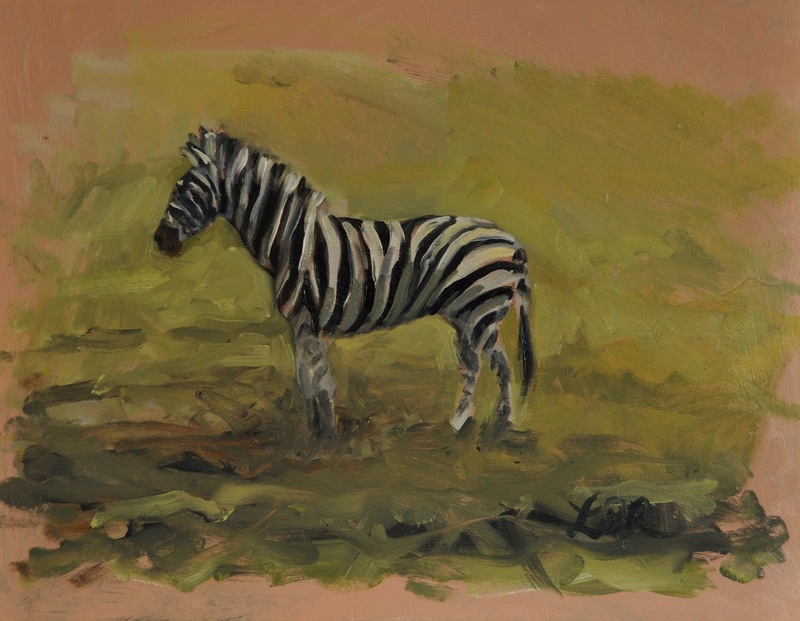 but given how hard it is to paint horses from life even when you have someone to hold them and shift them back into place, I decided painting zebra loose in a giant paddock would be impossible. I decided maybe some kind of sleeping lion or such thing might be do-able? Have to admit I felt a bit nervous wandering round choosing my subject- lots of people visiting the park who might potentially walk by and see me paint waaaayyyy out of my comfort zone- eek! Plenty of sleeping lions to be found, none close enough to paint though. There were some sleeping goats that probably would have sat long enough to be painted but it felt a bit of a cop out to come all that way to paint a goat... so I decided I might as well give the zebra a bash. Why not! Chose a spot next to one zebra and couldn't believe my luck when a couple more came over. Of course, they didn't stay still for a minute and moved all the time but having sketched the initial position of the first I was able to kind of use all three to pick out useful bits to add to the painting. They wandered off after about 15-20 mins after which I just had a VERY distant view to try and finish it off. Obviously there is a lot wrong with it BUT I expected to come home with a few suggested lines of a loose wild animal, not a recognisable painting of one, so I am very proud of it! Looking forward to visiting Yorkshire Wildlife Park again soon, a beautiful place full of beautiful and happy looking animals. Great family day out. Lots of photos taken too so brace yourselves for some zebra studio paintings coming soon! !